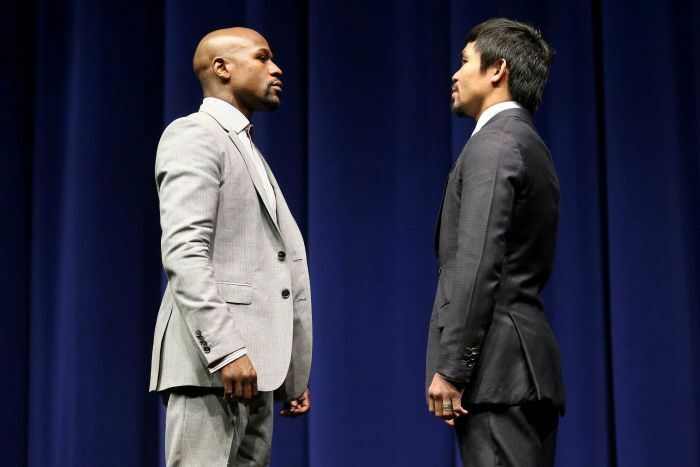 (AFP) – Manny Pacquiao and Floyd Mayweather have come face to face for the first time since their May 3 mega-fight was announced, as Hollywood rolled out the red carpet for the richest bout in history. The celebrated duo seemed almost subdued – unusual for the oft-outspoken Mayweather – as they posed and chatted for a phalanx of about 600 media representatives who were recording their every move, in the only joint news conference they will conduct before fight week. “It’s been a long road but we’re here now,” said the unbeaten Mayweather, as the countdown began to an eagerly awaited welterweight world title showdown under the lights in Las Vegas that has been a long – and at times fraught – five years in the making. “The fight is on and we’re very excited. Both of us will undergo hard training and we will do our best on May 2 to make you happy,” Filipino ring icon Pacquiao countered. Mayweather showed only rare glimpses of his “Money” Mayweather swagger – but did predict he would emerge with his unbeaten record intact. “I believe in my skill. I believe in myself,” said the 38-year-old, who will put his 47-0 record on the line.